There were acres of forest behind her childhood home and nestled amongst the trees was a small river. As soon as she could walk, Emily Hall, a Ph.D. student in the Washington State University School of Biological Sciences, was out in the forest and along the banks of the river, looking for slimy things under logs and playing in the water. Whenever Hall went out to her river, she was on a quest to find the creatures of the forest and unravel their secrets. She was constantly asking questions: How do fish survive under the ice? How does the movement of the water affect the creatures that live in the river? What did these creatures look like up close? Her parents, noticing their daughter’s obsession, continued to encourage her curiosity. When Hall was in high school, her family moved from New Jersey to Michigan and she had to leave her beloved river behind. But, much like the tadpoles she chased as a child, Hall was destined to return to the water. It was the summer of 2007, the first summer of Hall’s undergrad at Michigan State University. She was an environmental biology and zoology student and was still on the fence about pursuing a degree in research, but she knew she loved science. She took as many science classes as she could, but it wasn’t enough. It was a study abroad flyer hanging on a bulletin board in the zoology department that got her back on track. “It was advertising a tropical biology course in Costa Rica at a research station called La Suerte Biological Research Station,” Hall says. During the three-week course, Hall worked with researchers from around the globe and got to conduct her own project from start to finish. Hall wasn’t quite sure what she wanted to research, until one day she decided to take a hike through the forest. Clear cutting large patches of forest to make room for farms and ranches is a common practice in Costa Rica, Hall explains. In America, farmers will leave vegetation along the edges of the river to prevent erosion, but in Costa Rica there are so many streams. If the farmers left vegetation they would lose huge pieces of land, she says. Experiencing the drastic difference between the forest and farmlands, Hall decided to study how cattle ranching affected the invertebrate communities in the streams. Without vegetation along the rivers to prevent run off from the farms the water quality would decrease, affecting the forest, the people, and even the cattle. And so, Hall ended up back in the water. Knee deep in the water, Hall spent her days collecting samples and tracking invertebrate population levels in the streams. She found that the center of the forest was mostly protected from the erosion. After three weeks, Hall completed her research and headed back to the states. Although not the most groundbreaking research she admits, Hall’s work in Costa Rica had inspired her. Water was the source of life and vitality and also the most susceptible to human influence. She wanted to continue working with it, in it, and near it. After spending her undergraduate career working in the water, Hall knew she wanted to continue her work with freshwater ecosystems and amphibians. As she approached the end of her time at Michigan State University, she went on a quest to find her next step. Hall turned to the internet for more information. That’s when she came across the name of a Washington State University professor who was trying to answer a very interesting question. Erica Crespi had just started at WSU as an assistant professor in the School of Biological Science. With a background in ecological developmental biology, Crespi was interested in how physiological measures could be used to indicate a population’s health. She was specifically interested in frog populations and that was something Hall could get behind. When Hall arrived in Pullman, Crespi immediately turned her around and sent her off to Connecticut to work with a Ph.D. student at Yale. Crespi wanted to collect data on frog populations at a microscale, specifically how road salt affected the tadpoles. It was much easier to collect this data in New England because they have more bodies of water, some near roads and some far, which allowed Hall to see just exactly how salt affected wood frogs. After her first summer in Connecticut, Hall had discovered something: the salt levels in the water seemed to affect the frogs’ susceptibility to disease. She saw huge die offs in her monitored populations, which put her on the path to start her own research project on the connection between salt levels and frog health. Hall and Crespi are both conducting groundbreaking work, even if frog population levels seem like a minor thing. Frogs play a key part in the wetlands and the wetlands play a key part in the lives of humans, Hall says. Over her career Hall has found that educating the public on the importance of her research can be difficult and therefore finding funding can be a challenge. About a year into her graduate schooling she decided to apply for the Environmental Protection Agency STAR Fellowship in 2012. The fellowship was for $84,000 and it was geared toward graduate students who were interested in environmental research. She applied for the aquatic ecosystems fellowship, hoping for funding in 2013. At the time, her work in Connecticut hinged on the EPA fellowship. She just couldn’t afford it without the extra help. It was battle between practical and theoretical. Hall wanted to continue looking at a specific environment disturbance rather than study a broad theoretical question. It was a chance, but Hall decided to follow her heart and continue looking into road salts. To her relief, the funding came back in 2014. Now, the fellowship covers her tuition, her travel, and her supplies. Whatever else she needs is covered by internal grants through WSU. Without this support, who knows if Hall could continue. Deep in the woods of Connecticut, Hall was completely alone. It was the summer of 2011 and all she had was a truck and the GPS coordinates for a handful of ponds. Well, she thought to herself, it was time to get to work. Hall had just been picked up from the airport by her research counterpart at Yale and driven to the Yale-Myers Forest in northeastern Connecticut. Her task: monitor populations of wood frogs in ponds along the roads. Unfortunately, Hall’s partner been pulled away to work on another project. It was up to Hall to run the project, by herself. In field biology, one has to get a little imaginative, Hall explains. When it came to housing the tadpoles, Hall wanted to keep her populations in their natural environment, but also needed to ensure that her populations remained intact. She needed a way to keep them in and keep predators out. Once she got the hang of creating the enclosures, she thought she was set, but Connecticut had something else in store for her. During summer in New England thunderstorms are not uncommon. In fact, Hall often enjoyed the sound of the storms, until one a big one rolled through. At the time, Hall was staying in a one room cabin with white plywood walls and a single, leaky window, by herself in the woods. It kept her close to her tadpoles, but it put her right in the middle of the storm by herself. Thankfully, Hall and her tadpoles survived the worst of it. She checked all of the enclosures the next morning and nothing had been severely damaged. It wasn’t until her tadpoles arrived back at Pullman that things started to go a little awry. The tadpoles Hall had sent back to Pullman were dying. Back in Connecticut, she was also seeing huge die offs in her ponds. The ponds were almost unrecognizable, covered in thick layers of dead tadpoles. She was devastated. It was Jesse Brunner, another professor in the School of Biological Sciences and Hall’s other advisor, who figured out what was wrong. He’d been studying the ranavirus in frogs and he noticed that the tadpoles had similar symptoms. After talking with Brunner and continuing to study her ponds, Hall realized that only some of the ponds had such huge mortality events and these were the ponds near the roads. Now, Hall was on to something. How was the salt affecting the tadpoles? She had to find out. “I did a lot of research at Michigan State, but I didn’t feel a lot of ownership over it,” Hall says, recalling her first taste of research during her undergrad. It was rewarding, but nothing like her work now. 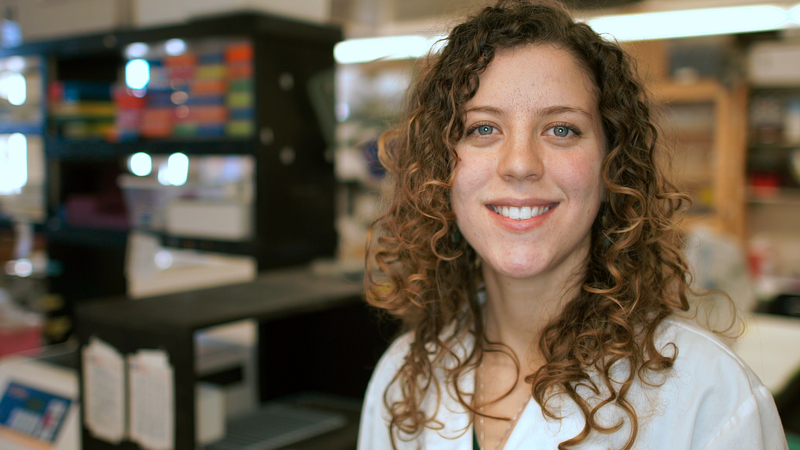 “This project was really the start of my passion for research,” she admits. Now, five years later, Hall spends her summers in Connecticut, studying wood tadpoles and traipsing through the forest, returning to WSU in the fall to continue her research and work alongside Crespi. It’s a weird arrangement, but it works for Hall. Sometimes, Hall thinks she’s found paradise. It’s a beautiful summer day in the Yale-Myers Forest of Connecticut. Alone in a one-room cabin in the middle of the woods, Hall climbs out of bed and gets ready for a day of field research in the woods. Could there be a better way to spend the day? She doesn’t think so. The first thing she grabs is her waders, her thigh high rubber boots that protect her legs and feet from the water as she wades into a pond to count tadpoles. Usually she’ll also grab a water-quality meter, just in case she needs to grab samples, and a net to catch the tadpoles. If she’s going to catch tadpoles, she’ll also need a cooler to house them in. And, of course, she’ll need to bring a book. Something in the fantasy genre should do just fine. She’s always been fond of Lord of the Rings. Her motley assortment in tow, Hall heads out. Sometimes, she’ll hop in her car and drive along the forest road. More often though, she’ll hike out. All of this preparation links back to her main question: How are road salts affecting the frog populations? To help prove her theory, Hall is collaborating with other WSU researchers to collect and analyze water samples, monitor population sizes, and assess the frogs’ health. To do this without killing the frog, Hall is using a new technique called eDNA, which is a system that can determine if the virus and frogs are present with only a water sample. And so far, it doesn’t look good for the frogs. Basically, these tadpoles are under a lot of stress trying to deal with the road salt, she says. The tadpoles are spending too much time trying to process the salt and not enough growing big and strong. Unfortunately, saving tadpole populations is not the highest priority to the public, Hall admits. More often than not people are more concerned about the safety of the roads and therefore rely on road salt to remove ice and snow. The only complaint they have is that it will damage car parts, not that it’s killing animal population, Hall says. There are plenty of reasons to be concerned about the amphibian populations, Hall says. Frogs often act as sentinel species, she explains, which means they’re the first species to be affected when something goes awry in the environment. If the frogs are dying off that means the rest of the ecosystem is often at risk. She was in the final stretch of her undergraduate at Michigan State University and Hall was interested in moving on to grad school. She browsed the internet, reading recently published scientific papers and looking at shots of campus, but a picture of a campus just wasn’t enough, she remembers. Thankfully, one school offered to pay for her travel. In early 2011, Hall flew out to Pullman to visit the WSU School of Biological Sciences. When she arrived, it was a bit of a shock, but in the best way possible. A native of the east coast and Midwest, Hall wasn’t prepared for the welcoming culture or the beautiful landscape she found on the Palouse. Before Pullman, Hall had also been closer to big cities. She’d grown up near Detroit and New York and had never experienced a small town. She took to it very quickly. But, it would take more than a beautiful view and welcoming small town feel for Hall to decide to stay somewhere. Was the faculty the right fit? Could she find someone to work with? “Some people joke that picking your advisor is like picking a spouse, so you can imagine how getting along with your advisor is going to seal the deal,” Hall laughs. And WSU did not disappoint. Five years later, when she’s not in Connecticut doing field work, Hall is trying to give back to the community that welcomed her with open arms. In addition to teaching and mentoring undergraduates, she’s now part of the Biology Graduate Student Association, which is the group that put on the spring time symposium she attended as a prospective student visiting WSU. The symposium is a way to introduce potential graduate students to Pullman and help them feel at home in the Palouse. The BGSA also puts on community outreach days, which are events designed to introduce elementary school children to the wonders of science and nature. During the outreach days, the club will meet out a Phillips Farm and set up science booths to show children things under the microscope or help them spot birds in the wild. When thinking about the future, Hall has big ideas. Yes, continuing her groundbreaking research plays a key role, but she would also like to have a hands-on part when it comes to the next generation of scientists. And, of course, her journey to help create the next group of scientists starts in a river.